For many businesses, accurate phone number data is important. 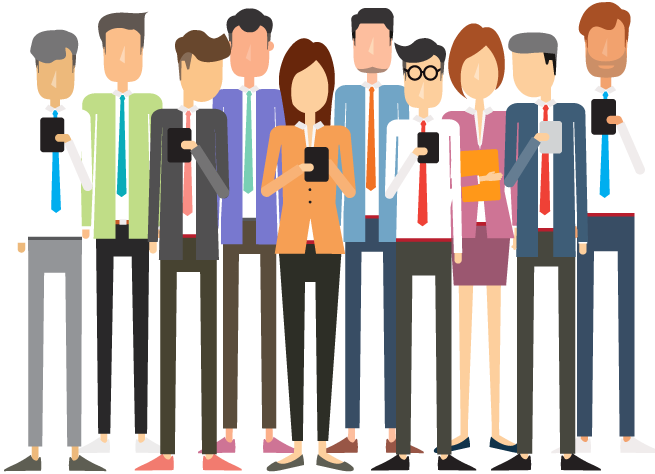 Companies running telephone or SMS based advertising campaigns waste countless resources dealing with inaccurate phone data while trying to reach prospective customers. The same is true when contacting existing customers. If the customer’s contact number is no longer active then that’s another wasted call or text. It may be hard to imagine compared to everyday personal experiences with telecommunications but on a commercial scale thousands or even hundreds of thousands of dead end calls and texts add up to huge losses in productivity. The most common measure of this productivity is the conversion rate. The conversion rate is the ratio of the number of successful conversions to the number of attempted conversions. Different companies have different definitions of what constitutes a successful conversion but for a standard marketing campaign it would generally be defined as convincing a prospective customer to become a paying customer. Of course, attempted conversions are attempts at converting a prospect into a customer. Since attempted conversions include even calls made to disconnected numbers it is easy to see that the quickest way to improve conversion rates is to use call lists with fewer disconnected numbers. As an example let’s say an advertising campaign manager named Marsha is tasked with performing cold calls to recruit new customers. She has a database with 100,000 numbers in it for her call center to work with. At the end of her campaign she examines her results and sees that they made 17,000 conversions. 17% is a respectable number. That is an almost 5% increase! Now Marsha’s boss is much happier with these results. This outcome is entirely within the realm of possibility. After validating millions of phone numbers we’ve found that on average about 20% of the numbers are disconnected. That means that your conversion rate after validation will be on average 25% greater than your pre-validation conversion rate (post-validation = 1.25 * pre-validation). As seen in the example above, Marsha’s post-validation rate was roughly 25% greater than her pre-validation rate (21.794 ~= 1.25 * 17). Now that we’ve seen the importance of having validated lists of phone numbers, there are some other aspects of this situation we need to examine. Firstly, it’s important to validate phone data when you receive it. However, because of something called “data decay” this alone is not enough to ensure your lists are clean. Data decay is the idea that data in a list will become outdated as time passes. Even if your list is perfectly clean upon your receiving it, many months later customers and prospects will have changed their contact information making those entries invalid. 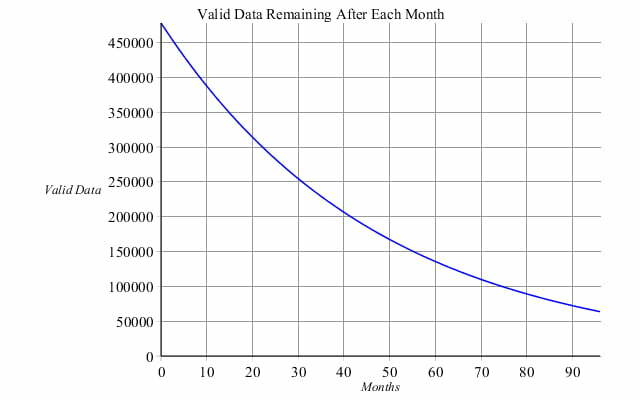 We’ve found that on average the rate of data decay for any list of information (email, phone, address etc.) is about 2.1% per month. This is an annualized rate of 22.5%. Say our advertising campaign manager Marsha receives a list of 500,000 numbers. She immediately validates and finds that 478,000 of these numbers are connected. Then she doesn’t use these phone numbers for a whole 7 months at which point her boss approaches her with another campaigning initiative. This chart shows how the quality of the data decays over time. From the above chart we can see that after 7 months we’ve lost about 66,000 phone numbers to data decay. Let’s assume that Marsha did not validate her data before running this campaign. If we also assume that she has a 20% conversion rate for each connected number then we can see that her conversion rate is automatically about 3% worse after 7 months. This is because her conversion rate decays at the same rate as her data, assuming she always has the same success converting prospects into customers. This example illustrates the importance of real-time data validation. Not only does it improve conversion rates but it saves employee man-hours that may have been otherwise wasted on calling disconnected numbers. For instance, if the call center Marsha used spent only a single minute on each disconnected number then they have wasted 66,000 minutes of their time on rotten data. That’s about 45 days! This is a staggering loss of time that can be directly attributed to not validating their data. In summary, the quickest way to improve your conversion rates is to simply validate your call lists. This removes bad numbers in turn removing inevitably unsuccessful conversions. This is not only important for improving conversion rates but also for reducing time lost to bad data. As we saw in the previous example bad data quickly adds up to huge losses in productivity. It’s also important to periodically validate your data due to data decay which slowly reduces the amount of useable data in your lists. This is why real-time data validation is so valuable for businesses. It can easily improve marketing results and boost employee productivity. RealPhoneValidation offers the most accurate Phone Validation Service available.